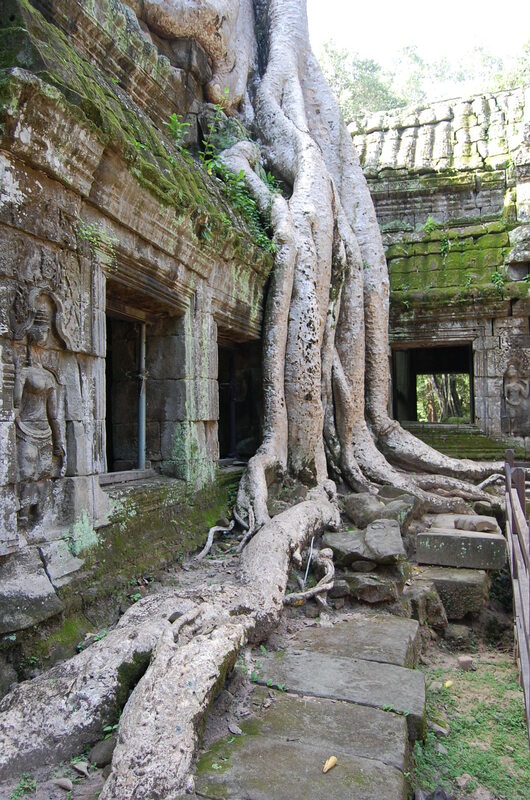 One of the nicest experiences I had in Cambodia was at Ta Prohm, the jungle temple, partially unrestored and overgrown with massive fig and silk cotton trees. The trees grow up out of the stone and wrap themselves around the huge blocks so tightly they move them. 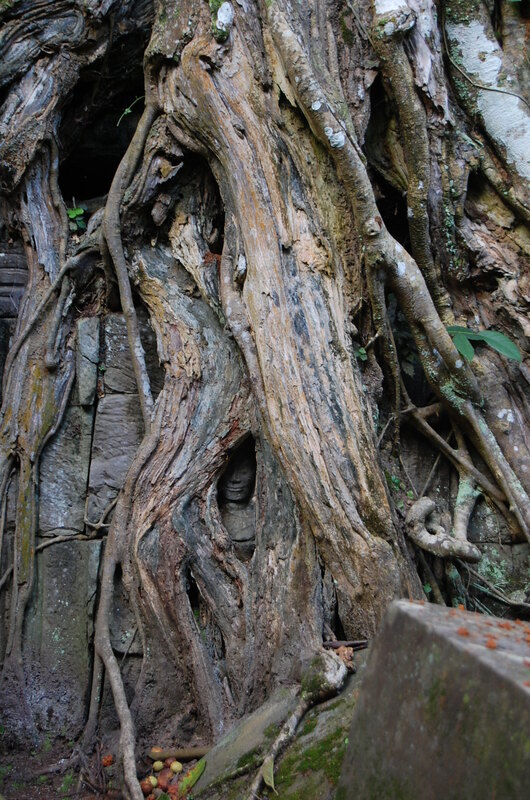 At this temple, trees are not cut unless they are in danger of falling down. One tree growing straight up over the entrance has a scar in the middle of the trunk that looks like an eye, watching you enter. 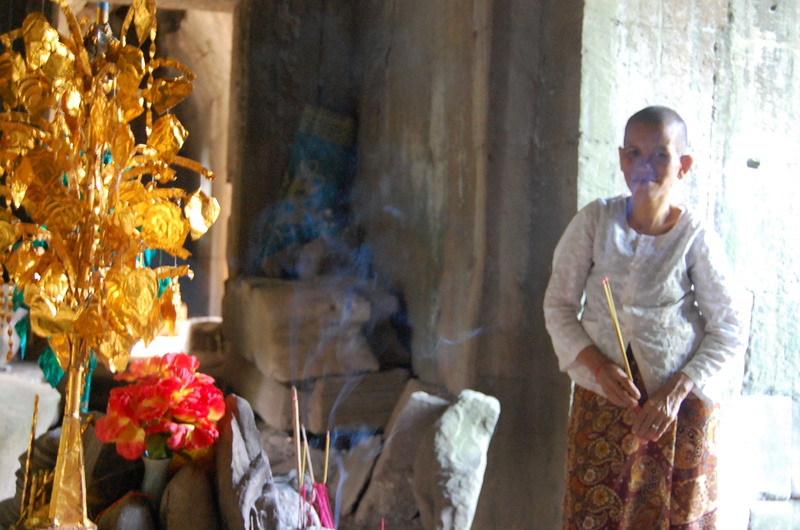 While walking through the temple there are many small spaces where people have set up altars with offerings. One in particular had a shiny gold tree and all kinds of containers to hold incense, one of which was a Pringles can. It was being attended by a small old woman with a hunched back who tied a braided string around each of our wrists and chanted a prayer. She struck me more than any of the others, because she seemed so happy and she never asked for money. I felt like we made a connection. Upon our return I was looking through my pictures and found that she wasn’t really very old at all. As a matter of fact, I rarely saw anyone old in Cambodia. 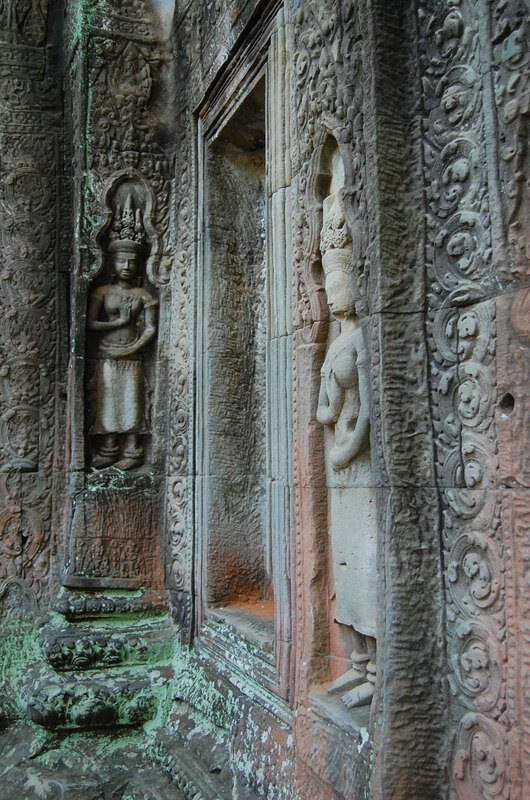 This is just one more reminder of the Khmer Rouge – it is inescapable when traveling in Siem Reap. There are still signs warning against walking in the jungle due to land mines. Many who have been injured by land mines are now musicians playing traditional music at the Wats or the Night Market. Their injuries are such that they are no longer able to do other jobs. Our guide, Rathanak told us that land mines were only cleared after the death of Pol Pot in 1999 and they still hear them going off occasionally. It baffles me to think of such violence happening in such a gentle place.